Karen is the oldest member of the team. This third-year student comes from an affluent family and is a member of the student council. Her parents are musicians and often go on tour. She misses them, but will not ask for them to come home for fear of disturbing their work, so despite wealth and popularity, she is often lonely. Komachi is her best friend and a fellow student council member. Seen around school as cool and inspiring, most of the students look up to her. She, as Nozomi learns, is the most trustworthy Cure. In the beginning, she is reluctant to join the Cure team. In episode 6, as the girls are being manhandled, Karen stands up to her friends, vowing to protect them regardless of transformation. The butterfly that eluded her previously reappears and successfully lands on her wrist, enabling her to transform to Cure Aqua. For catching Pinkies, Coco gets a violin from her Pinky Catch. 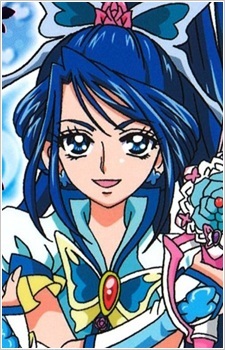 As Cure Aqua; counterpart of Cure Mint, she wears deep blue in her outfit, resembling Cure Mint's outfit. She introduces herself as "Blue Spring of Intelligence, Cure Aqua!" (知性の青き泉 キュアアクア!, Chisei no aoki izumi, Kyua Akua!) Like Nozomi and Komachi with Coco and Nuts respectively, she has a special bond with Milk. In the first movie, her counterpart is Dark Aqua, who is voiced by Reiko Kiuchi.